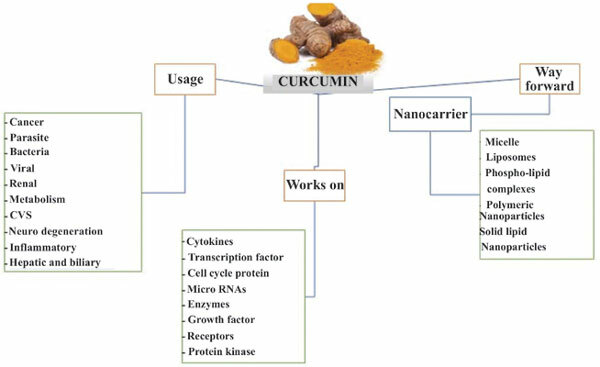 Curcumin, a polyphenolic compound, has been subjected to a variety of antimicrobial, antiviral and antifungal investigations due to its extensive traditional uses. It has been used traditionally in various Asian countries including China and India for its biological activities like anti-inflammatory, antioxidant, anticarcinogenic, antimutagenic, antibacterial, antifungal, antiviral, antiulcer, hypotensive and hypocholesteremic. The lack of sufficient antifungal compounds with reduced side effects necessitates the importance of studying natural compounds for this purpose. The antifungal activity of curcumin, as well as its mechanism, has already been investigated in the literature. The promising results for antifungal activity of curcumin against various fungal species make it a good candidate, where the effect can be synergized by the addition of other natural and synthetic antifungal agents. This review aims to summarize fungal infection, its causes, conventional methods of treatment, the potential of herbal drugs especially curcumin for antifungal activity. Curcumin, antifungal potential, polyphenolic compound, fungal infection, anti-inflammatory, antiangiogenic.